Big things come in small packages…. | The International Cricket Hall of Fame. Home » What's on » Big things come in small packages…. Often when you visit a museum there are so many incredible things on display that it is easy to overlook some of the smaller items in the collection. Sometimes you have to know where to look and what to look for. For example, the new ‘Origins of the Game Gallery’ at The International Cricket Hall of Fame displays two unique but rather small objects that if you’re not careful you may miss, which would be a shame as they are just fascinating. The first item, a small greeting card (c.1850) features a young boy in cricket garb with an inscription underneath. By the 1850’s cards like this had become a popular and affordable means of personal communication but for us the importance of this particular card is the image. A closer look at the card reveals that although it pictures a very young boy, his bearing is quite adult like, he has one foot in front of the other, bat held slightly out, arm extended as if to doff his cap, he presents as all grown up and very gentlemanly. By the mid 19th Century Cricket was considered an important part of any young gentleman’s education as it was thought that life’s lessons could be learnt from cricket and ones character developed through playing the game. 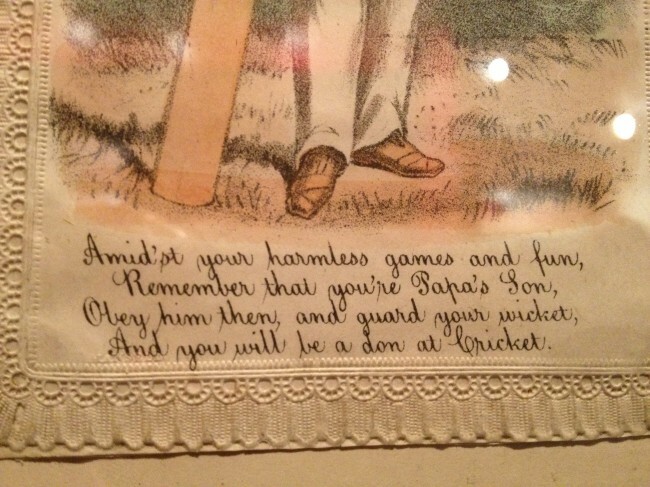 And you will be a don at Cricket. Less than a hundred years later being a ‘don’ at Cricket would come to mean something else entirely! 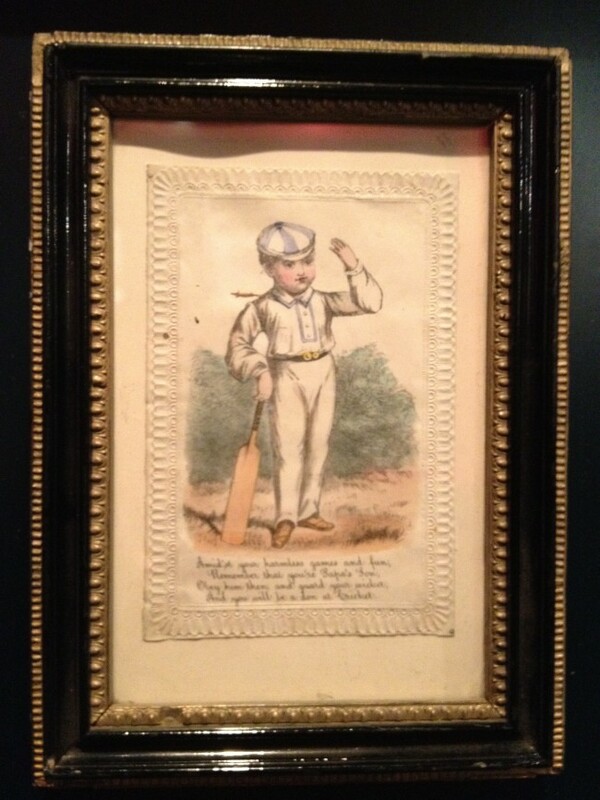 The next item is this lovely model of a cricketer from 1838. It would have been a decorative piece rather than a toy – but the interesting thing about it is the outfit, long white trousers, brown boots, white frilly shirt and a top hat – all normal cricket wear for the 19th Century but he appears to be holding an 18th Century curved bat – so it’s all a little incongruous! The little figure is placed is in a cricket pose; chest up, knees bent, bat at the ready and he stands in front of tiny wooden stumps. So much detail for such a small thing – only 7cm at most and incredibly it must have been made by hand, the head is wooden as are the cricket bat and stumps while his outfit is linen. How tiny must the stitches in his outfit be? Both these remarkable items, although made a decade apart represent the beginning of cricket in the home – when cricket as a pastime became commonplace amongst the common man as well as the aristocracy. The new Origins of the Game Gallery explores cricket from its early origins to the twentieth century. The Origins of the Game Gallery was officially opened by the NSW Minister for Sports and Recreation, Graham Annesley on November 26.